When avant-garde film pioneer Jonas Mekas left Soho for Greenpoint, it seemed like a setup for another sad story: the latest downtown icon in exile. Instead, the sprightly 83-year-old founder of Anthology Film Archives made Letter From Greenpoint, a high-spirited, wine-drenched rebuttal to the idea that the counterculture dies when you lose your loft. 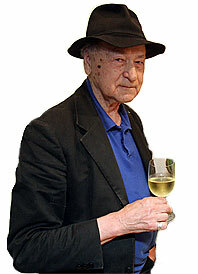 “Now I have a new set of friends, and bars,” Mekas says. In the film, he wails along with his accordion, flirts with his cat, Mitzi, and rhapsodizes about the beauty of singer Norah Jones. “Wine, women, and song is what keeps me going. Oh—and dancing.” Mekas likens his rejuvenating move to “when I changed from a Bolex to video” years ago. Now he’s on the cusp of another adventure. For Apple’s video iPod, he’ll be filming 365 short videos and releasing one a day, beginning September 15. Plus, he’ll be curating a downloadable series of classic shorts by experimental filmmakers and videos by the likes of Martin Scorsese, John Waters, Jim Jarmusch, and Abel Ferrara. “Life is beautifully, beautifully busy.” Go to jonasmekas.com for updates, or hear Mekas speak after the screening of Letter From Greenpoint at the Museum of the Moving Image, on August 25.